Replacing floor tiles, wood, or carpets can be expensive. Renters and homeowners on a budget often want to change the floor and the look of their space, but they need an alternative way to do it. That’s where a floor cloth comes in. It’s easy to create your own floor cloth that matches your décor; but, first, let’s take a closer look at what they are. What is a Floor Cloth? A floor cloth began as canvas area rugs in the 18th century. British homes used them to protect expensive rugs, tile, or other flooring materials. Back then it was a great way to upcycle ship sails. Today, artists and DIYers buy the canvas and use them as a fun, creative way to customize their space – often as a more personalized alternative to area rugs. Typically, they’re made of unstretched canvas with several coats of gesso and then painted and waterproofed, but that’s not the only option. Why Make Your Own Floor Cloth? As with everything these days, you can buy pre-made floor cloths pretty easily, but where’s the fun in that? Buying a pre-made one means you’re stuck with someone else’s design and vision. 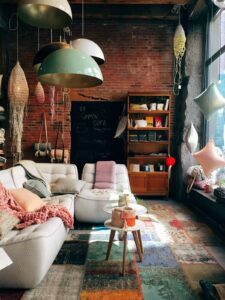 If you can find one that coordinates with your space, great; but how much more fun is it to make your own and truly customize it for your home? Lots more fun! Plus, it’s great way to impress visitors. Imagine they compliment it, and you can say “Thanks, I made it myself.” That’s what DIYers like us live for, right? 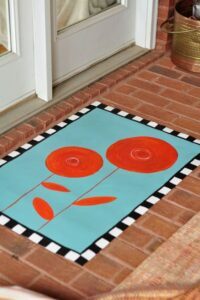 If you’re handy with a paintbrush and love to create art on canvas, painting a floor cloth might be right up your alley. You can also use stencils to get the look you want if free-hand painting isn’t your thing. HGTV has a great method for doing this. But leave yourself plenty of time as it includes several steps, many of which must dry in between. We don’t suggest this as a last minute “perk up your space” project before company arrives. Once done, however, this method gives you a gorgeous floor cloth with a hard finish that’s safe to walk on in any shoes. Another option is to buy the floor cloth canvas and use your fabric scraps to create a pattern. We love this idea since we’re not super handy with creative painting (stencils or not), but Emily is amazing at quilting. 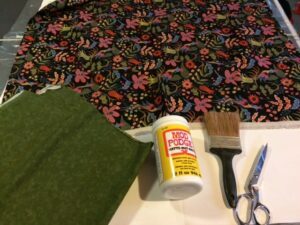 Once you’ve cut the canvas to size, arrange your fabric on it the way you want and use mod podge to hold them in place. 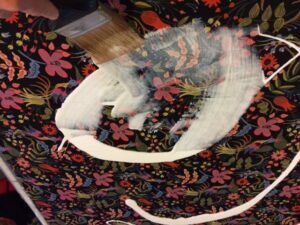 We suggest at least two coats of mod podge to ensure a good seal. Although this is awesome for people who aren’t confident when painting, be careful about walking on it with stilettos or cleats! Mod podge won’t harden the same way polyurethane does. Besides being a super fun way to personalize your space for a little amount of money, making your own floor cloth has other benefits, too. It’s an indoor project, so it’s great to do on rainy or snowy days when you and/or your kids are going a little crazy. And it’s a kid-friendly project. They’ll love helping you paint designs or placing fabric to make a floor cloth for their room or play area. Have you made your own floor cloth? We’d love to see pictures and hear how it went for you! Share in the comments below. And if you’ve got another method for a DIY floor cloth, let us know! 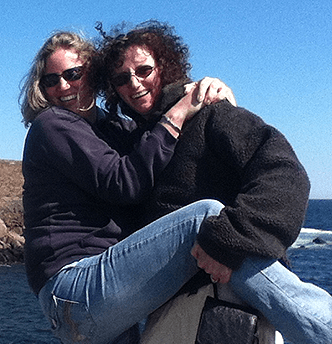 We just might feature it on the blog.